The Auto Cup Scheme allows Season Ticket holders the opportunity to secure home tickets for Liverpool's season-wide cup campaigns - the European, FA Cup and League Cup competitions. Tickets are automatically allocated to scheme members and once registered you’ll remain in the schemes for as long as the team is involved in the competitions you’ve enrolled into. As the Season Ticket Renewal period has ended, Season Ticket Holders can now only enrol into the Auto Cup Scheme during the Additional Enrolment Period. See below for more details. 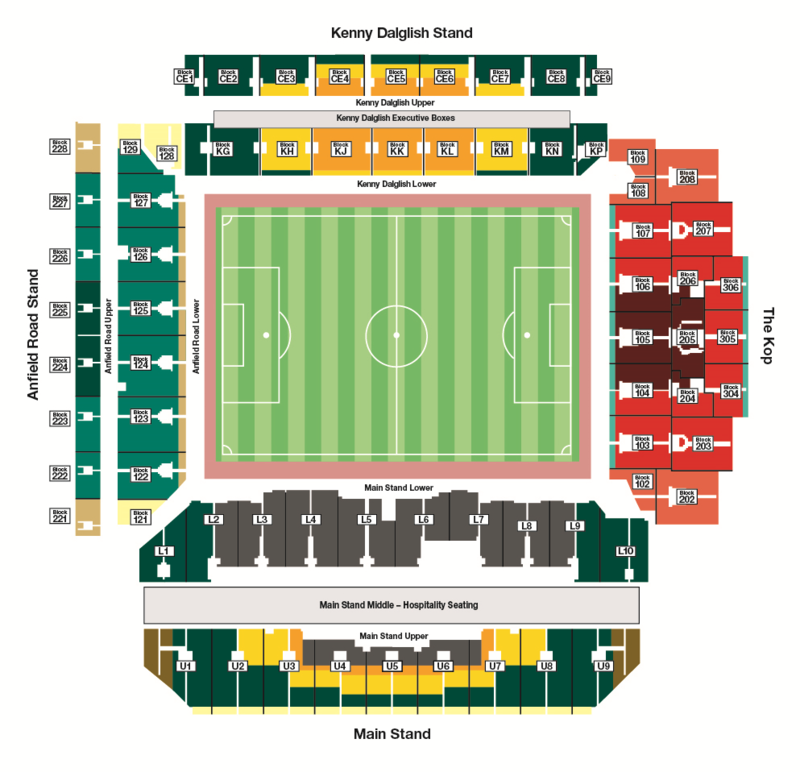 Select a different seat to your usual Premier League seat. Please note that your usual Premier League seat may not be available during the Additional Enrolment Period. Enrol during a period dedicated to Season Ticket Holders, which will allow you to sit with other Season Ticket Holders for Cup games. We recommend that you enrol no later than this point to be guaranteed a seat. Enrol during a period for Season Ticket Holders and Official *Members, which will allow you to sit with other Season Ticket Holders and/or *Members for Cup games. As capacity is limited we are unable to guarantee that enrolment will be available to all who apply. *Members may need to meet specific criteria to be eligible to enrol in to the Auto Cup Scheme. DO NOT WISH TO JOIN THE AUTO CUP SCHEME? The Club will continue to operate a priority sales period based on attendance at previous games for any remaining home Cup match tickets that become available but cannot guarantee that tickets will be available to all who apply. it’s due to holidays or other commitments. 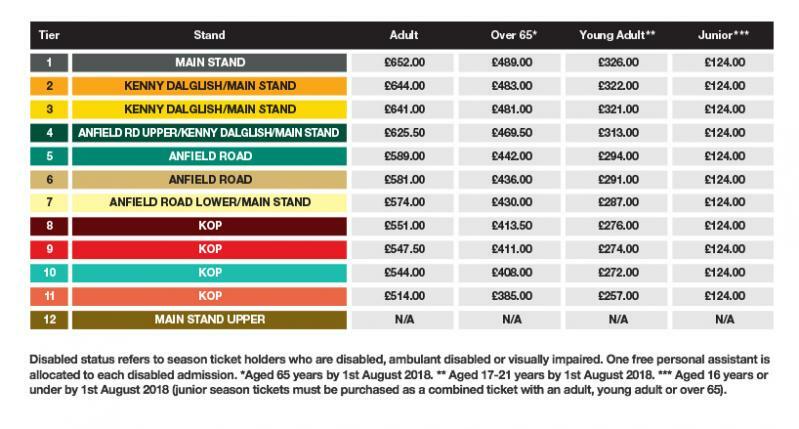 Why not release your seat to one of your fellow LFC supporters and avoid your seat being empty? Anfield’s unique and iconic atmosphere – even when you’re not able to attend! Get behind your team - use your Ticket Exchange Scheme and receive money back! It’s quick, easy and can be used as many times as you like throughout the season. 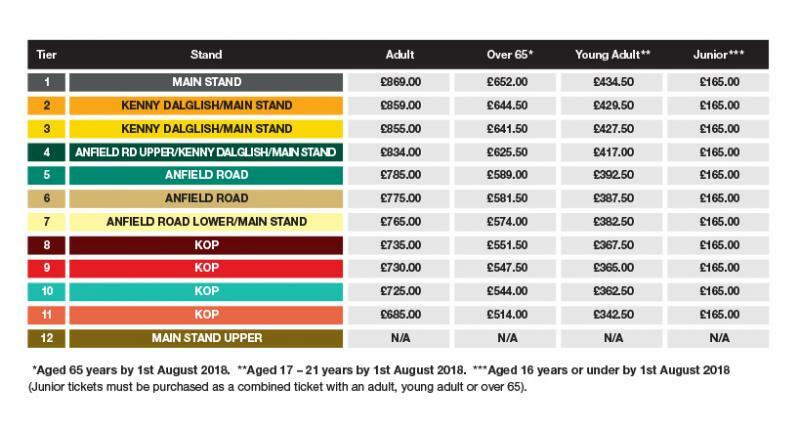 If you are a Season Ticket Holder in the Main Stand (price tier 1) and your seat was re-sold for the Manchester City game played on 14 January 2018, you would have received £44.25. Any rewards due against your Season Ticket Renewal for season 2018/19 included all games up to and including the Liverpool v Newcastle United home game (3 March 2018). Any rewards due for games after this will be credited next season. Free access to all Liverpool Football Club U18 & U23 home games if played at Anfield or the Academy, subject to availabilty.